We bought two of these to match the bedroom set available. It’s very pretty and has held up well over the years. We get many compliments on set. I appreciated how well it was packed for shipping too. 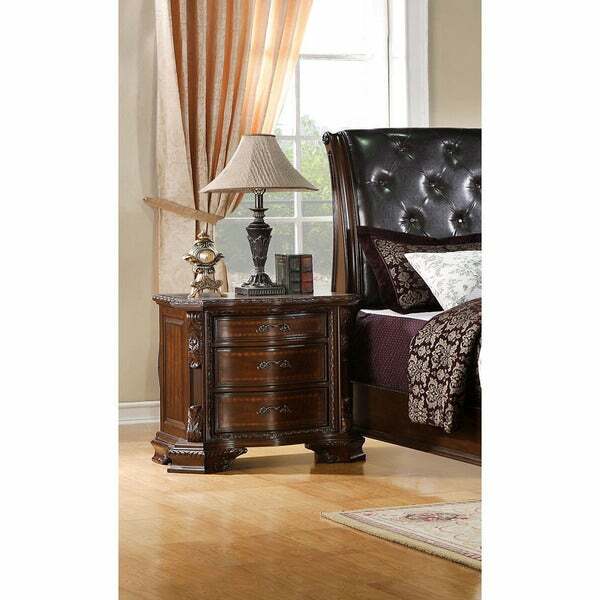 Add this beautifully carved nightstand from Furniture of America to your bedroom for a touch of class and sophistication. Featuring a rich dark walnut finish and solid wood construction, this three-drawer nightstand is the epitome of style and function. Designed with durability in mind, this piece is the perfect complement for a traditional-style room that needs a bold statement. Dimensions 30.13 In. X 18.0 In. X 29.88 In. I've purchased a pair of these...this is a beautifully finished, quality piece of furniture. The spacious drawers glide open smoothly, the detailing is great. I could not be more satisfied with these nightstands. Great nightstant! Very pretty and heavy. This is a really nice nightstand and it is well made. It came packed very well. I was concerned about that since it was heavy but it came without any damage. I actually got two of these and they are both nice and match very well. It arrived on time and I am very satisfied with this purchase and the product. Would recommend to others. I bought a nightstand with a bed but I decided to buy a second one for my husband. We love this brand items. They are nice, string and attractive. I am thinking to buy a second set of bed with canopy and dresser/mirror. All I can say that this was wonderful Buy from start to delivery.The night stand is more than beautiful. so well made. will out last me. Beautiful wood-carved design!!! I was amazed at the quality of this product! Drawers pull out in retract back in very smoothly!!! Excellent product for the pricing. Love my two nightstands. I’ve gotten many compliments on the entire bedroom suite. The nightstands are the perfect height and the drawers are nice and sturdy. Very happy with the set of nightstands. Just the right for our bed. Now waiting for the matching dresser and chest of drawers. Sturdy construction with excellent detail. Packaged completely and professionally with ample quality materials. Shipped in large cardboard box and arrived in excellent condition. Fantastic addition to the bedroom. Came put together. Very solid, looks very expensive, good quality. Schmancy. My teenage stepdaughter who likes everything victorian picked this out and likes it a lot. Matches the bed. Beautiful and well built but much darker than the picture suggests. Beautiful item. I own the whole bedroom set now. Drawers glide very well. "Are the drawers dove tailed??" The drawers of the nightstand are English dovetailed. See if it will look ok with the brown cherry bedframe and chest.